Ayni Projects - Tito's Summer 2013 Tour Has Been Extended! Tito's Summer 2013 Tour Has Been Extended! Tito La Rosa Final Events! sliding scale $80 to $125. This sound healing ceremony and baptism with flowers handed down by the Q'ero of the Andes near Cusco is an experience of deep beauty and spirit. If you have never experienced one of these, then maybe this is the time! The Chakana (square cross) is the symbol of symbols in the Ancestral Andean Tradition. It is said that it was not created and that it always existed. The chakana is that which orders the universe, the space that is within and the space that is outside. Within the Chakana is contained the three worlds. The Hanan Pacha, The Uhju Pacha and the Kay Pacha. The Grandfaters and the Grandmothers of the tradition divided the world, the Chakana, into these three worlds, the Hanan Pacha, the world above, The Uhju Pacha, the world within, and the Kay pacha, the world of the present or the here and now. In this workshop-ceremony we will experience these three dimensions of time and space and life. The Chakana is also a celebration of life and its diversity. The Chakana is also a bridge to the cosmic, to the trancedent, and to ones interior. The Chakana is sacred geometry, it is sound and it is Light. In this workshop we will work with the four sacred directions, with your chaupin, your center, your power, your essence. 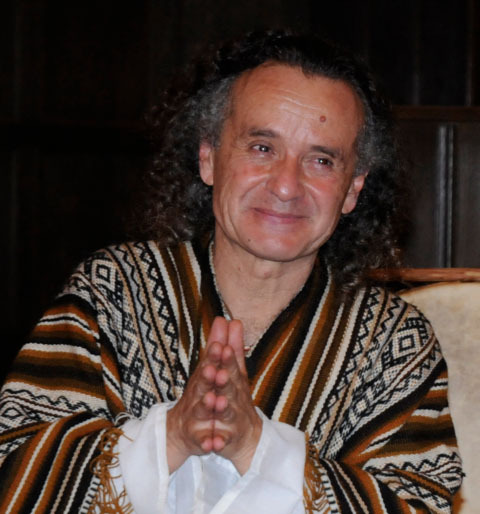 El Poder Curativa de los Instrumentos Ancestrales de Antigua Peru This class is always new and different and is filled with wisdom, humor and skill building for sound healers. The work is linked to the tradition and teaching of the Cosmovisionof the Ancient Andean Culture..You do not have to be a musician to attend. The course focus on how to work shamanicaly with sound to facilitate opening and healing. Private Music lessons and Private sound healing ceremonies are also available. If you are interested in buying one please email me so that I can add you to the list. Tito's work helps Ayni Projects fund the Chaupin School in the town of Carhuaz in Ancash., Peru. Please share via your social network and forward this announcement to your friends that might be interested using the icons below. Thank you!